It is a real delight to join you tonight. This gathering could not have taken place at a better time. Yesterday, Chinese Vice Premier Ma Kai and British Chancellor Hammond co-chaired the eighth China-UK Economic and Financial Dialogue in London. I am sure, you are all keen to know the outcomes of this dialogue. I would say that this dialogue has been very successful and fruitful. All together 63 outcomes have been reached. First, the dialogue helps build a new bridge to dovetail the development strategies of China and the UK. China sees Britain as an important partner in advancing the "Belt and Road" initiative. Britain welcomes the role of Chinese businesses in the building of the Northern Powerhouse. Our two sides have shared desire to make our respective strengths and industrial strategies work for win-win cooperation. Second, the dialogue helps bring our bilateral trade and investment cooperation to a new level. Both sides are committed to concrete improvements in reciprocal market access and a fair and level playing field for each other's businesses. Our two countries recognise the significance of Hinkley Point C as a good example of collaboration. We can further deepen cooperation on civil nuclear power, high speed rail and space projects. We can advance our cooperation in infrastructure and industrial development. Third, the dialogue pinpoints the new highlights in our financial services cooperation. China and the UK have agreed to work for stronger financial services cooperation and exchanges on financial monitoring. Both markets will be open and welcoming to each other's financial institutions. 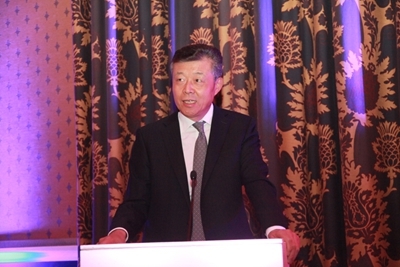 China supports the growth of the RMB offshore market in London. Britain supports a bigger role for the RMB in the SDR basket. The two sides have agreed to constantly expand cooperation in Fintech and green and inclusive finance. Fourth, the dialogue encourages our two countries to tap into the new cooperation potential in third country markets. There is huge potential for China and the UK to cooperate in third country markets. This is a new source of growth for our bilateral cooperation. We will continue to engage in close communication and consultation, and advance cooperation in third country. We will take real actions to turn the new potential into fruitful results. We must allow everyone in the cooperation to benefit, that is, the people of China, the people of Britain and the people of the country where we cooperate. Fifth, the dialogue enables China and the UK to make new contribution to global growth. Our two countries have made the shared commitment to working with other G20 members to implement the outcomes of the G20 Hangzhou Summit. Together, we should speed up the structural reform. We should improve the multi-lateral trading regime. And we should advance the reform of the international financial system. Together, we will contribute to a strong, sustainable, balanced and inclusive global growth. After the Breixt Referendum in June, there has been some concern about the future of China-UK relations from the business community on both sides. I have, on many occasions, kept telling my friends this: The vital interests binding our two countries together have remained unchanged. And the fundamentals of China-UK relationship have remained unchanged. In early September, President Xi Jinping met with Prime Minister May during the G20 Hangzhou Summit. The two leaders reaffirmed the "Golden Era" of China-UK relations. And Vice Premier Ma was here in London this week to implement this agreement of our leaders to elevate China-UK relations and our bilateral business cooperation to a new level. Last month, the Communist Party of China held the Sixth Plenary Session of the 18th Central Committee. The meeting focuses on all-round strict Party governance. Specific rules are made to oversee party discipline. A stronger and more efficient leadership is essential for China as we build a clean government, grow the economy, achieve inclusive development and build a better country for our people. China will stay true to reform and opening up. China will strive to create a fairer, more transparent and foreseeable investment environment. This will facilitate closer China-UK cooperation and provide more opportunities to the businesses of both countries. 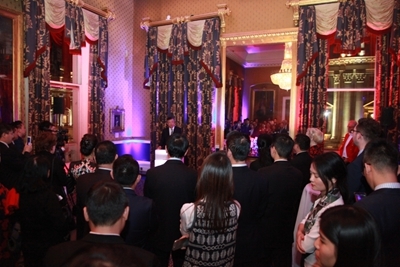 You are the key players in China-UK business cooperation. 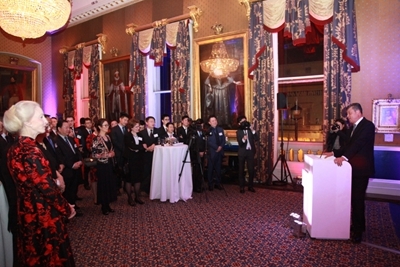 And you are the best representatives of the Chinese and British business communities. I hope you will seize the opportunities before us. I hope to see more win-win projects flourish through your cooperation. And I hope your hard work lead to more "golden fruits" in the "Golden Era" of China-UK relations.